It’s a work of fiction, but there’s certainly lots of horrible history in Terry Deary’s new book, the first in a series. 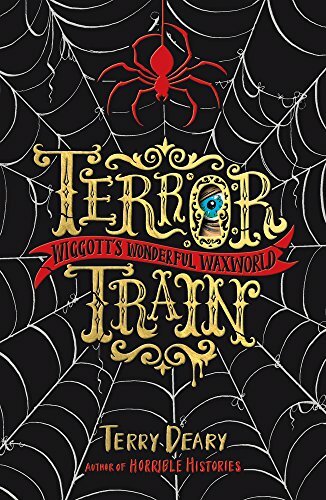 Terror Train is a fantastical tale combining animatronics, time travel, the spookiest of spooky waxworks, and lots of humour. The MacGuffin is a new smartphone – in fact, a very, very smart phone – stolen from its dastardly creator by a boy known throughout the novel as Boy, who is under orders to deliver it to the mysterious Dr Wiggott in his office in his Wonderful Waxworld. Stealing the phone isn’t a problem for Boy, who is an expert thief, but the second part of his task is a lot harder: there’s something very strange about the Waxworld, and venturing out of the train carriages that carry you through it takes you into the real worlds of the scenes represented – not fun if it’s the deck of Blackbeard’s pirate ship, the torture chamber of the Tower of London, or Lindisfarne moments before the Vikings arrive. Fortunately for Boy, the phone in his pocket helps him out of a variety of sticky situations, and keeps him one step ahead of hapless PC L.O. Elloe (yes, every opportunity to squeeze a joke out of this is taken). But there’s something strange about the phone too – could it have something to do with the disappearance of a young girl? Structured like the best farce with characters tumbling through doors, a lot of fast talking and even quicker thinking, the action will certainly keep young readers on their toes. One of the book’s particular pleasures however is the narrative voice, which communicates directly with readers via a series of footnotes (100 in total), commenting on the action, reminding us of important plot developments and clues, and sharing jokes. A fun, frenetic read that sneaks all sorts of fascinating historical facts in with the adventure.